I've got some good stuff this month, ladies. A little something for you and something for the little girls, too! As we make our move from summer to fall, it's important to update your beauty routine as well. Even the smallest tweaks in products can make a big difference. 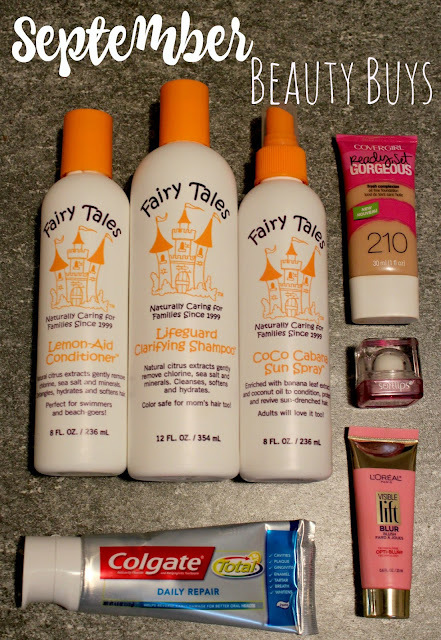 Here are the products I latched on to last month and have become staples in my daily beauty routine rotation. After a summer of chlorinated pools and salty ocean waters, we were in need of some serious hair nourishment. The Fairy Tales Sun and Swim line is ideal for little girls, but can be used by the mamas too! The Lifeguard™ Clarifying Shampoo cleanses and hydrates to remove chemicals and salt and sand build up to leave hair clean, shiny, and soft. The Lemon-Aid™ Silky Soft Conditioner hydrates hair while detangling it for soft, tangle-free locks. The CoCo-Cabana™ Sun Spray is the perfect way to hydrate and detangle in between swims. Spray generously from scalp to ends and comb through with your fingertips. For more information, visit www.fairytaleshaircare.com. My teeth go through the wringer on a daily basis. From drinking warm lemon water to coffee to overzealous brushing, I can use all the help I can restoring and strengthening my teeth. Colgate's Daily Repair Toothpaste helps to reverse early damage to teeth and gums. The multi-active formula helps repair damage that you may not know exists and it helps to remineralize weakened enamel to prevent cavities and kill bacteria. I wasn't a big blush girl until I discovered this blush. It delivers the anti-aging benefits of Visible Lift·while blurring dullness with a sheer touch of color. Simply swipe a small amount Visible Lift Blur Blush on the cheekbones for contouring and definition. Available in 3 shades - I love Soft Peach. As the colder, drier weather approaches, I need to start thinking about lip care. My lips get very chapped in the winter, and I'm always looking for great products to add hydration to my lips. Softlips Cube is a 5-in-1 (moisturizes, smooths, protects, shines, and replenishes) lip care system that's functional and sleek. It contains SPF 15 for sun protection. While we were on vacation, one of my sisters gave me this as she didn't want it. I took it and was eager to use it, not really knowing what to expect. Was I pleasantly surprised. Ready, Set Gorgeous offers flawless coverage that lasts all day with just one product. I didn't need concealer or a primer. It's oil-free so it won't clog pores and is available in 12 different shades.